Brace yourselves, because a stunning turn of events just upended the Supreme Court confirmation hearing. After a morning featuring mostly routine questions for Judge Neil Gorsuch, Trump’s pick for Supreme Court justice, the procedures took a turn into uncharted territory as Nancy Pelosi took to the podium and asked the nominee if any single one of his precious law books had anything to say about love. The question was so simple, and so beautiful, that it opened Gorsuch’s eyes to what really matters, and prompted him to rescind his bid for the court’s bench. “I—Well, I…I suppose I don’t…” Gorsuch stammered, visibly affected by her words. Struggling to regain his composure, the judge was reportedly left at a loss for words before the Senate Judiciary Committee as he searched his feelings and realized that Pelosi had just asked the one question he had failed to ask himself for all these years. 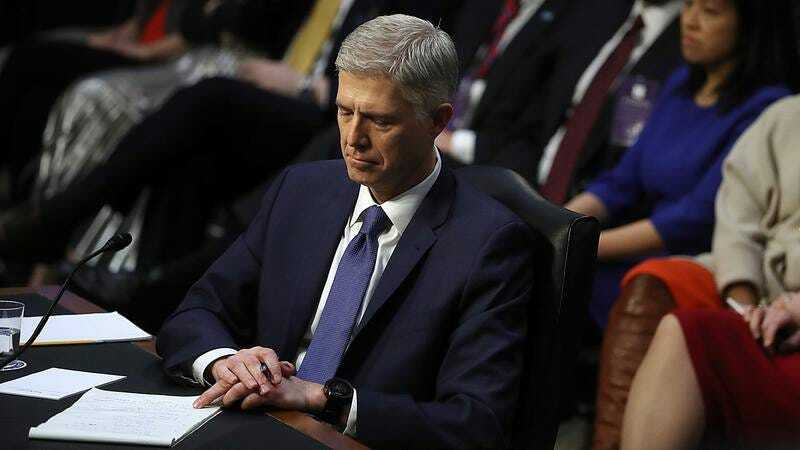 After several seconds of silence, Gorsuch was overheard muttering the words “What am I doing? This is all wrong,” to himself as he sat back in his chair and began loosening his tie, setting off a wave of murmurs and gasps that swept through the Capitol in response. The committee chairman hammered his gavel, demanded order, and prompted Gorsuch to speak up to answer the question for Congress. Wow. Looks like all it took was the right question for the Supreme Court nominee to understand what’s truly important. “Just get out of here already, and go to her,” Pelosi said with a knowing smirk, but Gorsuch was already running out the door, leaving the chaotic scene behind. By the time he made it to the airport, Gorsuch thought he was out of time and that his wife would be long gone. He pushed his way through the terminals, screaming, “Louise! Louise, wait!” barreling though the corridors, desperately trying to reach her gate in time. Louise heard the faint yells just as she was handing over her boarding pass, and then saw her husband running toward her. “Neil, what are you doing here?” she asked as he came to a screeching halt, trying to catch his breath. “But what about the Supreme Court?” his wife asked. Neil Gorsuch let out a laugh and smiled. “Let’s just say a friend helped me realize that love is the only case I ever want to rule on, and at home with you is the only court bench I need,” he said. The two kissed right there in the terminal before heading home. Wow. While no one thought that the confirmation hearing would go off without a hitch, a bombshell like this was certainly not on anybody’s radar. It’ll be interesting to see where the Supreme Court nominations go from here and what could possibly happen next.